On Saturday in front of a crowd of 3000 spectators the #1 ranked Raiffeisen Vienna Vikings defeated the Bergamo Lions 51-32. The Vikings started the scoring with a first drive touchdown by Clinton “JAMICAN RUMble” Graham, his first of four scores. The Lions were in position to tie the game, but an amazing interception by Mike Salami in the end zone ended the drive. In his first start of the season Philip Jobstman threw for two scores to Stephone Robinson and picked up MVP honors. After dominating the first half the Vikings went into halftime with a 35-7 lead. The Italians came out of halftime recharged and handed the ball off to their star running back Anthony Stallings who ran amuck picking up two scores and setting up two others. But in the end it was too little too late as time ran out. 44 L.Andre Sommersell      9    3 10.5     .     .   .     .      .    .      .     .
55 Claudio Biavati         5    . 5.0  1.0/3    . .     .      .    .      .     .
1  Mohammed Mortazavi      4    . 4.0     .     .   .     .      1    .      .     .
13 Davide Corradini        4    . 4.0     .     .   .     .      .    .      .     .
23 Giardano Pigolotti      3    . 3.0     .     .   .     .      .    .      .     .
43 Daniele Cantu           3    . 3.0     .     .   .     .      .    .      .     .
51 Davide Locatelli        2    1  2.5  1.0/1    . .     .      .    .      .     .
28 Davide Donnini          2    . 2.0     .     .   .     .      1    .      .     .
49 Francesco Cappannoli    1    2  2.0     .     .   .     .      1    .      .     .
54 Ezio Marone             1    2  2.0     .     .   .     .      .    .      .     .
74 Robert John Hopewell    1    1  1.5     .     .  1-0    .      .    .      .     .
80 Riccardo Regazzoni      1    1  1.5     .     .   .     .      .    .      .     .
36 Danilo Nessi            1    . 1.0     .     .   .     .      .    .      .     .
24 Antonio Antonaglia      . 1  0.5     .     .   .     .      1    .      .     .
4  Paolo Guerini           . 1  0.5     .     .   .     .      1    .      .     .
40 Simone Lazzaro          . 1  0.5     .     .   .     .      .    .      .     .
77 Patrick Pompilii        . 1  0.5     .     .   .     .      .    .      .     .
94 Florian Gruensteidl     7    2  8.0  1.5/3    . .     .      .    .      .     .
7  Johannes Neusser        4    1  4.5  1.0/1    . .     .      .    .      .     .
47 Micheal Bauer           4    . 4.0     .     .   .     .      .    .      .     .
6  Mike Salerno            3    1  3.5     .     .   .    1-0     1    .      .     .
56 Philip Bickel           2    1  2.5  0.5/1    . .     .      .    .      .     .
31 Mario Floredo           2    1  2.5  1.5/3    . .     .      1    .      .     .
26 Johannes Wimmer         2    1  2.5  1.0/2    . .     .      .    .      .     .
92 Armin Novidi            2    . 2.0  1.0/3    . .     .      .    .      .     .
82 Jakob Altersberger      2    . 2.0     .     .   .     .      .    .      .     .
28 Christoph Putz          2    . 2.0     .     .   .     .      .    .      .     .
42 Shawn Leever            1    1  1.5     .     .   .     .      .    .      .     .
90 Michael Dawodu          1    1  1.5     .     .  1-0    .      .    .      .     .
97 Alexander Taheri        . 3  1.5  0.5/1    . .     .      .    .      .     .
33 Marcus Greber           1    . 1.0     .     .   .     .      .    .      .     .
34 George Thomas           1    . 1.0     .     .   .     .      .    .      .     .
79 Valentin Gruber         1    . 1.0     .     .   .     .      .    .      .     .
29 Gregor Pachmann         1    . 1.0     .     .   .     .      .    .      .     .
2  Peter Kramberger        1    . 1.0     .     .   .     .      .    .      .     .
24 Bogdan Kasterovic       1    . 1.0     .     .   .     .      .    .      .     .
10 Philip Stojaspal        1    . 1.0     .     .   .     .      .    .      .     .
TM Team Vikings            1    . 1.0     .     .   .     .      .    1      .     .
85 Maximilian Koessler     1    . 1.0     .     .   .     .      .    .      .     .
51-D.Locatelli, 54-E.Marone, 55-C.Biavati, 74-R.J.Hopewell, 77-P.Pompilii, 80-R.Regazzoni, 88-F.Capodaglio. Pointner 1-5; Christoph Gross 1-minus 2; Philipp Jobstmann 1-minus 19. Pasha Asiladab 1-18; Clinton Graham 1-9. INTERCEPTIONS: Bergamo Lions-None. 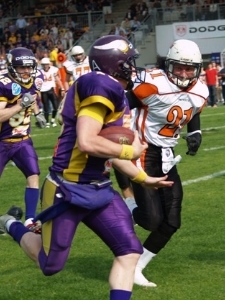 Vienna Vikings-Mike Salerno 1-0. Josiah Cravalho 1-0; Ralph Pointner 1-1. SACKS (UA-A): Bergamo Lions-None. 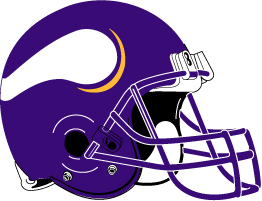 Vienna Vikings-None. B 1-10 B30   BER ball on BER30. V 1-10 V49   C.Graham rush for no gain to the VIK49, out-of-bounds (D.Donnini). V 2-10 V49   C.Graham rush for 9 yards to the BER42 (L.A.Sommersell). V 1-10 B15   C.Graham rush for 2 yards to the BER13 (D.Corradini). yards to the VIK18, out-of-bounds (M.Salerno). B 1-10 V18   BERGAMO LIONS drive start at 09:43 (1st). B 1-10 V18   A.Ghislandi rush for 2 yards to the VIK16 (F.Gruensteidl). B 2-8  V16   L.K.Dozier pass incomplete to R.Regazzoni. yards to the VIK-1, touchback. V 1-10 V20   VIENNA VIKINGS drive start at 08:59 (1st). V 1-10 V31   C.Graham rush for 2 yards to the VIK33 (L.A.Sommersell). V 2-8  B43   C.Graham rush for 4 yards to the BER39 (D.Cantu). V 1-10 B31   C.Graham rush for no gain to the BER31 (M.Mortazavi). V 2-10 B31   C.Graham rush for 3 yards to the BER28 (L.A.Sommersell). V 1-10 B20   F.Hiess rush for 6 yards to the BER14 (L.A.Sommersell). V 2-G  B03   C.Graham rush for 3 yards to the BER0, TOUCHDOWN, clock 02:24.
at BER3, C.A.Stallings for no gain to the BER3 (S.Leever). B 1-10 B03   BERGAMO LIONS drive start at 02:14 (1st). B 1-10 B03   C.A.Stallings rush for no gain to the BER3 (J.Wimmer). B 2-10 B03   C.A.Stallings rush for loss of 2 yards to the BER1 (F.Gruensteidl). B 3-12 B01   PENALTY BER delay of game (L.K.Dozier) 0 yards to the BER1. yards to the BER35, 1ST DOWN BER. B 1-10 B35   1st and 10. B 1-10 B35   L.K.Dozier rush for 1 yard to the BER36 (F.Gruensteidl). B 3-3  B42   Start of 2nd quarter, clock 12:00. B 3-3  B42   L.K.Dozier rush for no gain to the BER42 (A.Novidi). B 4-3  B42   PENALTY BER delay of game (E.Marone) 5 yards to the BER37. B 4-8  B37   L.K.Dozier pass incomplete to F.Capodaglio. V 1-10 B37   VIENNA VIKINGS drive start at 11:03 (2nd). V 1-10 B25   C.Graham rush for 4 yards to the BER21 (M.Mortazavi). DOWN VIK, TOUCHDOWN, clock 09:42. B 1-10 V24   BERGAMO LIONS drive start at 09:27 (2nd). DOWN BER, TOUCHDOWN, clock 09:26.
for 43 yards to the BER42, out-of-bounds (D.Corradini). V 1-10 B42   VIENNA VIKINGS drive start at 09:16 (2nd), VIK ball on BER42. V 1-10 B42   C.Graham rush for 8 yards to the BER34 (R.J.Hopewell;E.Marone). V 2-2  B34   C.Gross pass incomplete to P.Asiladab (M.Mortazavi). V 1-10 B27   C.Graham rush for 5 yards to the BER22 (D.Cantu). V 2-5  B22   F.Hiess rush for 3 yards to the BER19 (L.A.Sommersell). V 1-G  B06   F.Hiess rush for 4 yards to the BER2 (E.Marone). V 2-G  B02   C.Graham rush for 2 yards to the BER0, TOUCHDOWN, clock 06:02. M.Mortazavi for 3 yards to the BER29 (M.Koessler). B 1-10 B29   BERGAMO LIONS drive start at 05:55 (2nd), BER ball on BER29. B 1-10 B29   L.K.Dozier rush for loss of 2 yards to the BER27 (M.Floredo;P.Bickel). B 2-12 B27   L.K.Dozier pass incomplete to M.Mortazavi. B 3-12 B27   L.K.Dozier pass incomplete to F.Capodaglio (M.Salerno). V 1-10 B18   VIENNA VIKINGS drive start at 04:44 (2nd). V 1-10 B18   P.Jobstmann pass incomplete (F.Cappannoli). V 2-10 B18   C.Graham rush for 1 yard to the BER17 (C.Biavati). V 3-9  B17   Timeout Vienna Vikings, clock 03:58. DOWN VIK, TOUCHDOWN, clock 03:51. P.Kramberger kickoff 35 yards to the BER35, downed. B 1-10 B35   BERGAMO LIONS drive start at 03:50 (2nd). B 1-10 B35   C.A.Stallings rush for 5 yards to the BER40 (F.Gruensteidl). B 3-3  B42   C.A.Stallings rush for 2 yards to the BER44 (M.Salerno;F.Gruensteidl). B 4-1  B44   L.K.Dozier rush for 2 yards to the BER46, 1ST DOWN BER. B 1-10 V41   L.K.Dozier pass incomplete to F.Capodaglio. B 2-10 V41   PENALTY BER delay of game (L.K.Dozier) 5 yards to the VIK46. B 2-15 V46   L.K.Dozier rush for 1 yard to the VIK45 (M.Dawodu). B 3-14 V45   Timeout Bergamo Lions, clock 00:49. B 3-14 V45   C.A.Stallings rush for no gain to the VIK45 (S.Leever;J.Wimmer). B 4-14 V45   Timeout Vienna Vikings, clock 00:41. B 4-14 V45   C.A.Stallings rush for 9 yards to the VIK36 (M.Floredo). V 1-10 V36   VIENNA VIKINGS drive start at 00:34 (2nd). V 1-10 B46   P.Jobstmann pass incomplete to S.Robinson. V 2-10 B46   PENALTY VIK delay of game (P.Jobstmann) 5 yards to the VIK49. at VIK49, C.Graham for 7 yards to the BER44 (L.A.Sommersell). V 3-8  B44   Timeout Vienna Vikings, clock 00:12. B 1-10 B20   End of half, clock 00:00. B 1-10 B20   Start of 3rd quarter, clock 12:00, VIK ball on VIK30. to the BER38, out-of-bounds (M.Salerno). B 1-10 B38   BERGAMO LIONS drive start at 11:53 (3rd). B 1-10 B38   Timeout Bergamo Lions, clock 11:53. B 1-10 B38   C.A.Stallings rush for 3 yards to the BER41 (M.Bauer). to the VIK8, 1ST DOWN BER. B 1-G  V08   1st and 8. B 1-G  V08   C.A.Stallings rush for 1 yard to the VIK7 (M.Bauer). V 1-10 V47   VIENNA VIKINGS drive start at 10:13 (3rd). V 1-10 V47   C.Graham rush for 1 yard to the VIK48 (L.A.Sommersell). V 2-9  V48   C.Graham rush for 2 yards to the 50 yardline, out-of-bounds (D.Donnini). V 1-10 B38   C.Graham rush for 7 yards to the BER31 (G.Pigolotti). V 2-3  B31   PENALTY VIK false start (Blagojevic) 5 yards to the BER36. V 2-8  B36   PENALTY VIK false start (R.Meklau) 5 yards to the BER41. V 2-13 B41   C.Graham rush for no gain to the BER41 (C.Biavati). V 3-13 B41   P.Jobstmann pass incomplete to J.Altersberger (D.Donnini). B 1-10 B21   BERGAMO LIONS drive start at 06:25 (3rd). B 1-10 B21   C.A.Stallings rush for loss of 2 yards to the BER19 (J.Wimmer). B 2-12 B19   L.K.Dozier pass incomplete to F.Capodaglio. B 3-12 B19   Fumble by L.K.Dozier, fumble by recovered by VIK M.Dawodu at BER18. V 1-10 B18   VIENNA VIKINGS drive start at 05:28 (3rd). V 1-10 B18   F.Hiess rush for 5 yards to the BER13 (F.Cappannoli). V 1-G  B04   PENALTY VIK false start (V.Gruber) 5 yards to the BER9. V 1-G  B09   C.Graham rush for 9 yards to the BER0, TOUCHDOWN, clock 04:01. B 1-10 B46   BERGAMO LIONS drive start at 03:55 (3rd). B 1-10 B46   C.A.Stallings rush for 9 yards to the VIK45, out-of-bounds (C.Putz). B 2-1  V45   C.A.Stallings rush for loss of 1 yard to the VIK46 (J.Neusser). B 3-2  V46   S.Lazzaro rush for 1 yard to the VIK45 (F.Gruensteidl). B 4-1  V45   C.Carminati rush for no gain to the VIK45 (Team Vikings). V 1-10 V45   VIENNA VIKINGS drive start at 02:16 (3rd). B 1-10 B50   BERGAMO LIONS drive start at 02:09 (3rd). B 1-10 B50   C.A.Stallings rush for 4 yards to the VIK46 (M.Bauer). B 2-6  V46   C.Carminati rush for 8 yards to the VIK38, 1ST DOWN BER (M.Bauer). B 1-10 V38   C.Carminati pass incomplete to M.Sironi. B 1-10 V24   C.A.Stallings rush for 4 yards to the VIK20 (J.Neusser;A.Taheri). B 2-6  V20   Start of 4th quarter, clock 12:00. B 2-6  V20   C.Carminati rush for loss of 2 yards to the VIK22 (M.Floredo). B 3-8  V22   C.Carminati rush for loss of 5 yards to the VIK27, out-of-bounds. B 4-13 V27   C.A.Stallings rush for 21 yards to the VIK6, 1ST DOWN BER (P.Bickel). B 1-G  V06   C.A.Stallings rush for 6 yards to the VIK0, TOUCHDOWN, clock 10:28. BER43, P.Bickel return 8 yards to the BER35. V 1-10 B35   VIENNA VIKINGS drive start at 10:25 (4th). V 2-18 B43   P.Jobstmann pass incomplete to J.Altersberger, dropped pass (P.Guerini). the BER10, 1ST DOWN VIK. V 1-G  B10   1st and 10. V 1-G  B10   P.Jobstmann pass incomplete to J.Altersberger (A.Antonaglia). V 2-G  B10   F.Hiess rush for loss of 1 yard to the BER11 (D.Locatelli). V 3-G  B11   P.Jobstmann pass complete to J.Altersberger for 4 yards to the BER7. B 1-10 B26   Clock 07:17. B 1-10 B26   C.A.Stallings rush for no gain to the BER26 (A.Taheri;M.Dawodu). B 1-10 V43   A.Ghislandi rush for loss of 3 yards to the VIK46 (A.Novidi). B 2-13 V46   A.Ghislandi rush for loss of 2 yards to the VIK48 (F.Gruensteidl;A.Taheri). B 3-15 V48   C.Carminati pass incomplete to F.Capodaglio (M.Floredo). B 4-15 V48   Timeout Bergamo Lions, clock 05:07. B 4-15 V48   M.Mortazavi rush for 3 yards to the VIK45 (J.Neusser). V 1-10 V45   VIENNA VIKINGS drive start at 04:58 (4th). holding (C.Stein) 10 yards to the VIK35, NO PLAY. B 1-10 B43   BERGAMO LIONS drive start at 04:21 (4th). E.Marone kickoff 58 yards to the VIK12, out-of-bounds, VIK ball on VIK35. V 1-10 V35   VIENNA VIKINGS drive start at 03:41 (4th). V 1-10 V35   F.Hiess rush for loss of 3 yards to the VIK32 (C.Biavati). V 2-13 V32   F.Hiess rush for 3 yards to the VIK35 (L.A.Sommersell;P.Pompilii). V 3-10 V35   C.Gross pass incomplete to M.Thaller. V 4-10 V35   P.Kramberger punt 37 yards to the BER28, downed. B 1-10 B28   BERGAMO LIONS drive start at 01:59 (4th). B 1-10 B28   C.Carminati pass complete to R.Regazzoni for no gain to the BER28 (C.Putz). B 2-10 B28   C.Carminati pass incomplete to M.Mortazavi. B 3-10 B28   A.Ghislandi rush for 13 yards to the BER41, 1ST DOWN BER (M.Greber). B 1-G  V02   S.Lazzaro rush for 2 yards to the VIK0, TOUCHDOWN, clock 00:26. V 1-10 V39   VIENNA VIKINGS drive start at 00:18 (4th). V 1-10 V39   C.Gross rush for loss of 2 yards to the VIK37. V 2-12 V37   End of game, clock 00:00. > "one page in english". > This is not nearly a page. > Moreover the stats are still missing. > Deadline was Monday 6pm, gone. > Please again with stats.